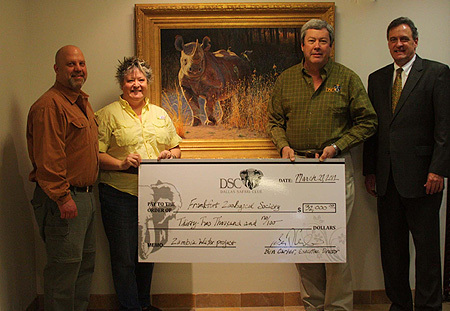 Dallas Safari Club gave a $32,000 grant for the North Luangwa Conservation Programme in North Luangwa Park, Zambia. This is a special project Jan and James have been working on to raise money for the anti-poaching rangers who are protecting the wildlife - particularly the reintroduced Black Rhino - of the park and surrounding area. Jan's painting "WE ARE BACK" shown in the photo was given to DSC as a Thank You for the grant. To date Jan's and James' involvement in the project has raised $69,000. 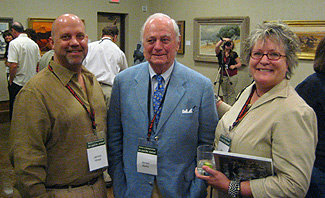 Jan and James at the opening of the new Briscoe Museum, San Antonio, Texas. James and Jan recently returned from their trip to Tanzania where they lead a small group on safari, but first they visited their gallery in Arusha - CULTURAL HERITAGE. The gallery purchased 7 original paintings by Jan and several of her giclées as well as many archival ink canvas photo prints by James. The gallery was four years in construction and is built on several levels. It will also have dayrooms, a theater and meeting areas. Jan and James in hand carved doorway to the gallery. James, Jan and Saif - owner of Cultural Heritage - in the gallery. FOX 23 reporter Emily Sinovic came to James' and Jan's home/studios to interview them for an upcoming special on noteworthy people and places in Bartlesville. The 3 minute segment will air the second weekend in July. 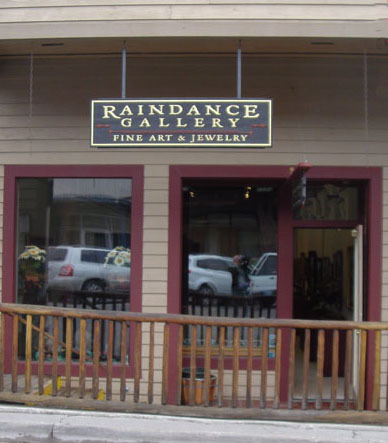 James has just signed with an new gallery called RAINDANCE GALLERY in Jackson Hole, Wyoming. This is just around the corner from the main square and in the prime gallery area. "We are very excited about James' work" says Joy Kennedy co-owner of the gallery. James will be sending mostly North American subjects, but will also be sending a few of his sepia Africa pieces. 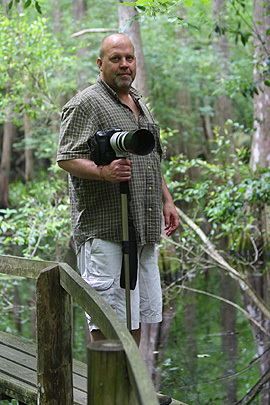 James and Jan recently returned from a trip to Florida where James photographed many wonderful scenes with herons, egrets, osprey, anhingas and ibis in beautiful cypress swamps. Look for new photos from this trip soon! James' and Jan's friends and clients Steve and Yvonne Miller of Dallas hosted a "Launch Party" to kick off James' upcoming exhibition of his work at DSC and SCI. The party was a great success, and Jan and James want to thank the Millers for opening their beautiful home for this event! 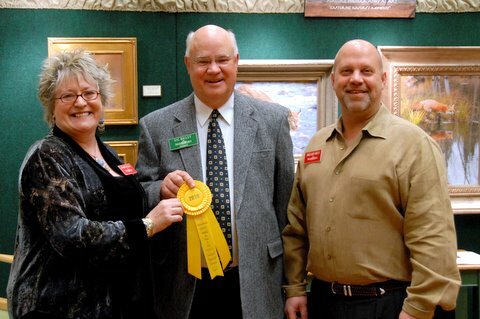 JAMES AND JAN AT "ART AND THE ANIMAL"
James and Jan got to visit with Jim Bellis, founder of the Hiram Blauveldt Art Museum in Oradall, NJ during the recent Society of Animal Artists 49th annual exhibition "ART AND THE ANIMAL". James' photo of a male lion on a kopje that he took in Tanzania has been featured in one of the top international hunting magazines AFRICAN SPORTING GAZETTE which is published in South Africa. James has a sepia photo of this same lion (slightly different pose) available as a fine art Archival Ink on Canvas. You can see it under his "Africa" images James Gary Hines II - Nature Photographer - Africa Fine Art Images. 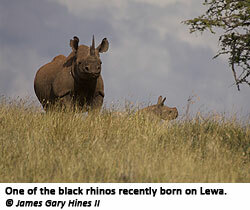 James photographed this new black rhino calf at the request of Lewa, spending two days trying to get close shots. James and Jan just returned from a wonderful trip to Yellowstone. While they were there, they saw four wolves (two black and two grey) on an elk kill which was close to the road. The next day while driving they saw one of the wolves that they recognized from the kill several miles away on the other side of a lake. It was trotting purposefully in the direction of the kill. Surmising that the wolf was returning to the kill, Jan suggested that they drive a little ways down the road, where they then parked and hiked down a small hill and then sat waiting. Sure enough within 15 minutes the wolf passed on its way to the kill. Here you can see the wolf checking James out. After deciding they were no threat, he continued on his way to the kill. James and Jan had their first exhibition together of James' photos and Jan's paintings at a fund raising event and party called COW THIEVES AND OUTLAWS for Woolaroc Museum. This was the first time that James has displayed his photographs (seen on the left part of the display). The event was very successful with James selling three of his large photographs and Jan selling two paintings and getting a commission. All told they expect to have generated over $3500 for the museum. Woolaroc has many historical western and native American artifacts, and a spectacular art collection of names such as Remington, Russell, Leigh, Rungius and more. James' image of a leopard in a tree graced the cover of GAMETRAILS magazine, the journal of the Dallas Safari Club, Spring 2008 issue. James took this wonderful photo in Samburu National Park in Northern Kenya. Many people find that locating leopards can be very difficult, but this particular trip James and his wife Jan who lead photographic tours, to Kenya saw and photographed 8! 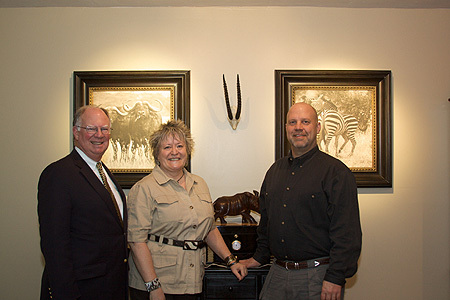 James and his wife wildlife artist Jan Martin McGuire went on an extensive photo/research trip to Tanzania in June. Jan uses both her and James' photos for her paintings www.janmartinmcguire.com and of course James is building his portfolio of his photos. 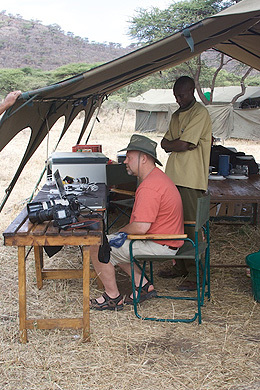 Here James is downloading some of his 8000+ digital images using solar power, to his laptop computer in their mobile tented camp in the Serengeti.